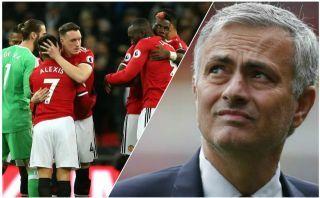 Man Utd boss Jose Mourinho has seemingly raised some serious question marks about his current squad after an overall disappointing campaign. The Red Devils will hope to end on a high note by winning the FA Cup later this month to secure some silverware but they’ve fallen badly short elsewhere. They sit 20 points adrift of Premier League champions Man City with just two games to be played, while they crashed out of the Champions League much earlier than expected to Sevilla. In turn, Mourinho is arguably right in questioning the quality of the current squad at his disposal as the numbers and results don’t lie, but ultimately this sounds a little more personal as he questioned the mentality of some of the players in the group and revealed he doesn’t trust some as much as others. “How many points separate us from Manchester City?” Mourinho said, as per ESPN. “Not two, three or four. A lot of points. “Some of the people we have, they have to be more consistent in their performance and we need more quality. I trust some more than others that can bridge that gap. “Some of the players I am totally convinced are going to make it, some others I have good hopes that they are going to make it and some others I don’t believe they are going to make it. In my squad, I have some players where I would like to have better than what I have. That’s basic. It remains to be seen how many changes are made this summer, but key additions may well be needed in order to bridge the gap and put the Red Devils in a stronger position to compete for major honours next season. Based on these comments, it wouldn’t be a surprise if a few players were axed too if the right offers came in.